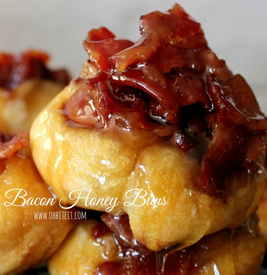 If you could take all that’s delectable in this world and combine it into one fluffy, sticky & sweet treat that’s topped off with the Crown Jewel of all deliciousness~yep…BACON, it would look and taste just like these Bacon Honey Buns! It’s true! These Honey Buns aren’t your Grandma’s cakey & dry Honey Buns~nope! These Buns are taken over the top with flaky Crescent Dough and sweet/smoky slabs of crisp candied Bacon!